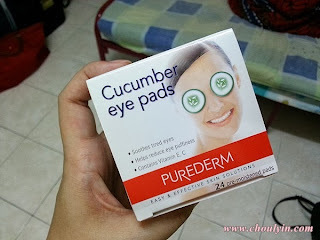 The Cucumber Eye Pads are soft pads that are pre-moistened with real cucumber and other soothing ingredients. 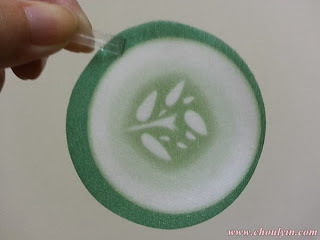 It has the aroma of freshly cut cucumbers, and help to reduce puffiness and appearance of dark circles under your eyes. The package comes with 24 pre-moistened pads, so you can use it a total of 12 times. It claims to be able to make your eyes feel refreshed after just one use. What do you think? Challenge accepted! 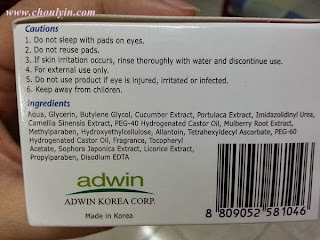 So here are the list of ingredients for the eye pads (lol it sounds like iPad) and lookie here! 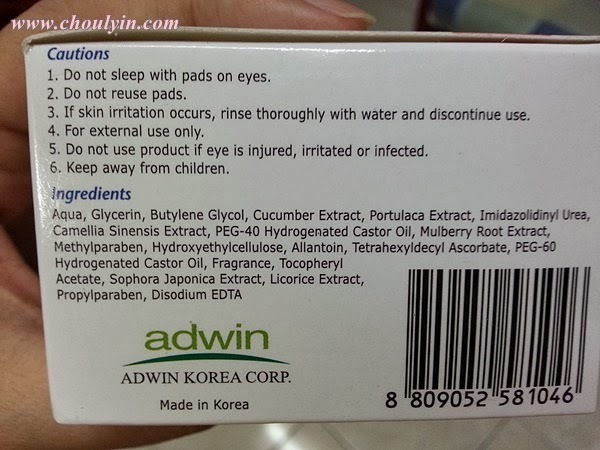 This product is made in Korea! Of course with the precautionary measures like not to reuse pads, to consult a doctor if you experience skin irritation, etc. This is the container storing the pads, and I like and dislike it at the same time. I like it because of the size, I can reuse the container after I have finished with my pads, and the container is plastic and sturdy, so I don't have to worry about it breaking if I accidentally drop them. I dislike it ALSO because of the size. Look at that! the 24 moistened pads barely took up HALF of the container. What a waste of space. I would love it more if they were to give 50 pre-moistened pads instead. Either that, or make the container smaller so as not to deceive the public. 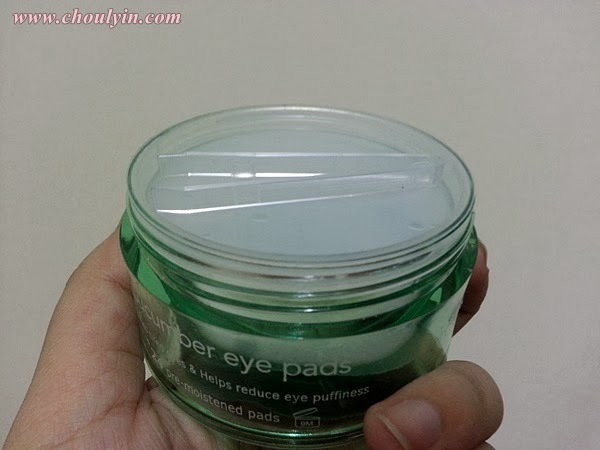 The container also comes with pincers that you can use to pick up the eye pads so as not to contaminate the remaining pads in the container. 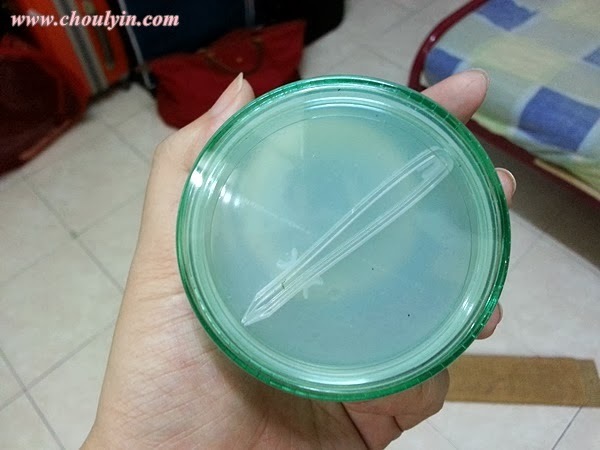 As it is a damp environment in there, the less contaminants you introduce into the container, the better as you will be putting these on your eyes. 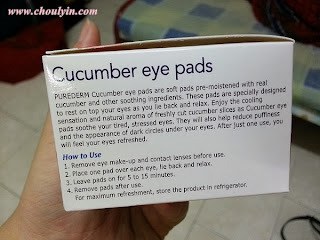 So this is how the eye pads look like. They are really thin, about the thickness of a piece of paper. I like how they made it look like cucumbers :) Really nice touch. When I was using the eye pads, I had the minty cooling feeling on my eyes, and I like it. I relaxed almost immediately and I was really comfortable having them on my eyes. 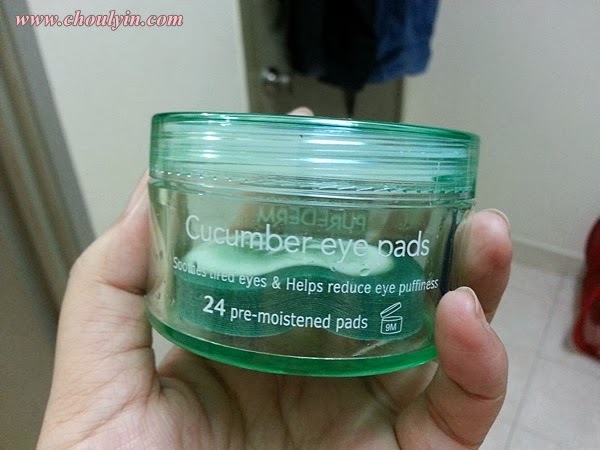 After using them, my eyes actually felt quite refreshed. However, not much change in my dark circles, so perhaps I need to use them for a longer period in order to see the difference? 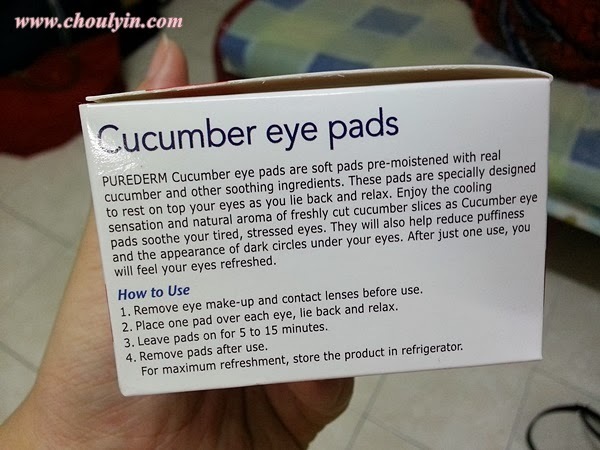 So would you get this Eye Pad for your eyes? Let me know in the comments section below! Lol. So deceiving! I always passed by this section in Watsons but never ended up getting it hahaha.